Mrs. Folashade Tinuade Rahmat LEDIJU (Nee Davies) was born on 2nd February, 1961, an indigene of Lagos State from the Olowogbowo Area of Lagos Island. She started her academic journey at the Ideal Girls’ Primary School, Falolu Road, Suru-lere, Lagos State and proceeded to New Era Girls’ Secondary School, Ogunmola Close, Suru-lere, also in Lagos between 1972 and ’78. She thereafter attended the prestigious Federal School of Arts and Science, Victoria Island, Lagos for her A-Levels. A graduate of 1984 with B.A English & Linguistics from the University of Ilorin, Kwara State and MPA from the University of Lagos, 2003. She is as Associate member of Chartered Institute of Personnel Manage-ment of Nigeria (CIPMN) 2003, Nigeria Institute of Training and Development (NITAD) 2005 and Fellow of Association of HR Practitioners (AHR). The tour started with the Lagos State Development & Property Corporation, Ilupeju (LSDPC) in 1978 as a Clerical Officer (vacation job) on the documentation of the Jakande Housing Schemes. After her A-levels, she had a one year break to work with the Nigeria National Petroleum Corporation, Falomo as a Higher Executive Officer, Personnel Department as Head, Recruitment Unit – 1979/80. Her NYSC was a Teaching assignment at the Emilis Private Commercial Secondary School, Calabar, Cross River State. As a graduate, she was given appointment at the Nigerian Television Authority (NTA 7, Tejuosho as a Presenter/Announcer and later Programme Producer/ Presenter between 1986 and 1996. 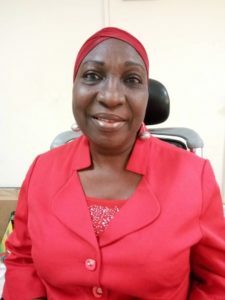 Mrs. Lediju, in the quest for challenges moved on to AIT (DAAR Communications Ltd), the first private Media outfit (1979-1999) and was employed as an Assistant Manager/Programme Producer, Children & Youth Programmes; later rose to AGM and nominated for the Nigeria Media Merit Award (NMMA) as the best Youth Talk Show Producer. The programme was titled ‘Our Time’. Lagos State Government Career tour started in 1999, employed by State Civil Service as a Principal Admin. Officer GL.12, w.e.f 6/10/1999 and deployed to the then Parastatals Monitoring Office 1999-2001 attached to the Inspectorate Directorate and was next to the Assistant Director, GL.15. Thereafter, moved to Lands Bureau, F & A Dept between 2001 & 2005 where she served as the Training Officer, Head, Budget Unit and Later Head, Personnel Unit. With demonstrated dedication and commitment, she earned herself recognition and was given the opportunity to hold brief as the D (F&A) when she substantive retired. She was later deployed to MOE/OES as Asst. Chief Admin Officer, GL. 13 between 2005 and 2007, she served as Head, Policy Research & Statistics (PRS) and doubled as the DFA during the Director’s leave. Between 2007 and 2016 she was deployed to the Lagos State AIDS Control Agency as Chief Admin. Officer, GL.14 to serve as the Agency Secretary and rose to the post of Deputy Director, GL.16. At the Agency, she served as the Secretary, Head (F&A) and Procurement Specialist (Lagos State HIV & AIDS Programmes Development Project). She was also the Secretary for the Lagos State Chapter of the National Women Coalition on HIV/AIDS under the Chairmanship of the Lagos State First Lady. The long stay was due to the World Bank Project lifespan. By March 2016, she was deployed to the Civil Service Commission to serve as the Director, Career Management. She performed remarkably well that the Promotion exercise though remodeled was professionally handled and letters were unprecedentedly released by the 15th of June, 2017, which very well met up comfortably the financial effective date of 1st July, 2017. Having earned her promotion to GL.17, she was in July 2017 deployed to the Ministry of Education as the Director, Administration and Human Resources.